Exercise adds so much to my life. It gives me energy and plays a big part in making me happy. It gives me "me time" that I cherish. It improves my health (I haven't gotten sick, even a cold, in two years!). It gives me an excuse to eat that slice of cheesecake when I go out with friends or have an extra serving of barbeque. It is a gift that I give myself. It relieves stress. It makes my jeans fit better. It clears my mind. I can't imagine my life without exercise in it. I think everyone should give themselves the gift of fitness. If you're looking to start a new exercise plan or just trying to stick with one you already have, here are some tips that have worked for me. 1) Set a realistic plan. Plan out what is going to work for you. 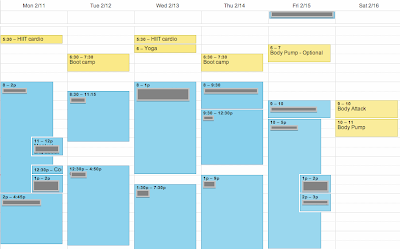 Plan which days you'll work out, what time, and what you'll do. Personally, I like working out in the mornings, mostly because I like getting it over with! Being done with my workout before I start a busy day makes me feel great, gives me energy, and doesn't leave me anticipating it all day. Plus, I know myself, and it is very hard for me to go to the gym at 7pm after a long, hard day. Well, not just hard -- it doesn't happen. When I have all day to think about going to the gym, I'm much more likely to find a reason not to do it! Either I'm hungry and can't decide whether to go before or after dinner, or I don't really want to take a shower afterwards since I have to take one in the morning, or I have too much work to do tonight -- there's always something. When I go early, I'm in the gym before I even totally realize what's going on. It doesn't leave much time to change my mind! One of the most important parts of setting a plan: be realistic. Don't plan to workout every single morning at 5am if that's just not something you could really do. Be honest with yourself. 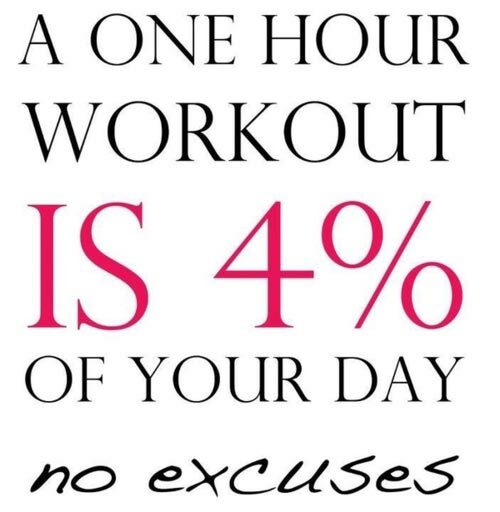 If all you can commit to is 3 mornings or afternoons a week for 20 minutes, that's fine! Just set a plan that works for you and that you can realistically stick with. 2) Make it part of your regular schedule. 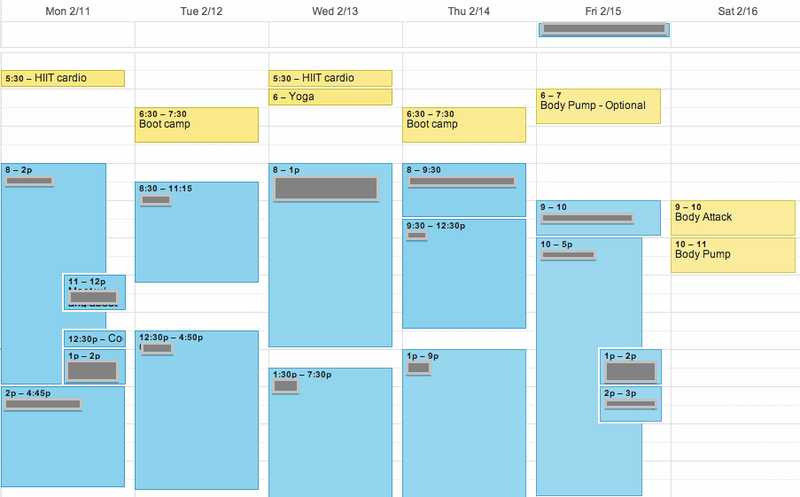 Along with a calendar for my work schedule and meetings, I have a "workout calendar." Seeing your planned workouts as part of your daily schedule puts them on the same playing field as required meetings - they are just a part of your day! If you have a plan going in, you're more likely to stick with it -- rather than asking yourself, "should I work out today?" you're asking, "am I going to mess up my plan today?" It's harder to say "no" to the second question than it is to say "no" to the first question. Along the same lines, try not to see working out out as an option, and don't over-think it. 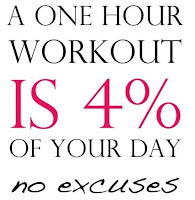 Of course, it is a choice to work out - a good choice - but you're more likely to go when you conceptualize it as a required part of the day just like showering and going to work. And by "don't over-think it" I mean just that - don't think too much about going before you go. When my alarm goes off in the morning, the longer I lay there and think about whether or not I should get up and go, the less likely I am to do it. Because you will always be able to think of excuses ("I'll go later instead" or "wellll, I could go Sunday instead of today and it would be the same thing" or "It's too cold outside" or "but my bed is so comfortable right now" or "maybe I'd benefit more from getting an extra hour of sleep" or "is this one workout realllyyy gonna make a difference?" or "I'll stick to my schedule once swimsuit season is closer") Don't allow yourself to find one of these thoughts that prevents you from getting up and going! Instead, just get up right when you hear that alarm - tell yourself, "don't think about it. just go." 3) Pick something that you like enough. I know people say your workouts should be fun. And they certainly can be. But I don't think "fun" is a requirement... you just need to like it enough. If you absolutely hate running, don't run! If you think yoga is boring, don't do yoga. Simple. But on the other hand, don't expect to find a workout that you love that you can do regularly. Of course hiking is great, but if you can only hike on weekends in the Spring and Fall, then you need something else. I can't say I love the treadmill, but I still do it a few times a week because it's challenging and convenient. Plus, I balance it out with things that I really do like - a group boot camp class and yoga. Don't do something you hate, but don't necessarily expect to enjoy the elliptical the way you enjoy dancing at a club with your friends. Okay, I'm biased, but I think weight training is everything! Cardio is good if you want to lose weight or burn off some of that dessert last night, but cardio isn't going to change your body. Weights are. I didn't think I'd ever be able to do 50 consecutive push-ups (the "real" kind) or squat my body weight, but I have! And these kind of exercises are my FAVORITE. In addition to aerobic exercise, add in squats, lunges, dead lifts, bicep curls, tricep dips, and planks. And don't worry if you have to start light -- just keep adding. Starting with pink 5 lb dumbbells is not necessarily bad, but you shouldn't be there long. See what you're capable of! And, women out there, don't be afraid of "bulking up." That will not happen. Unless you decide to start taking steroids as well. Which I would not recommend. Weight training will not make you bulky, it'll make you lean and solid! It'll also make you burn more calories throughout the rest of your day, and let you be able to lift that big table without asking for help. Do it! 4) Stick through it long enough to see results. This is big. Nothing motivates you to stick with an exercise routine more than seeing the benefits of sticking with an exercise routine! After six weeks or so of consistently sticking with a workout plan (and eating healthy as well... exercise can only do so much! ), you should be able to start to see a change in your body, health, and life. This is what will have you sticking with it in the long run. 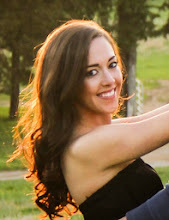 Love the yoga shot of you, you gorgeous gal! thank you!! 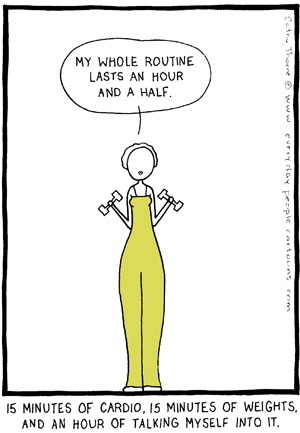 :) yes, scheduling is a great way to see exercise as a responsibility not an option! Great post! Your workouts are so early, when do you go to bed?! thanks! I try to get at least 7 hours of sleep a night, so if I'm waking up at 5 I try to get to bed by 10; if I'm waking up at 6 I try to get to bed by 11. doesn't always happen but I do my best! 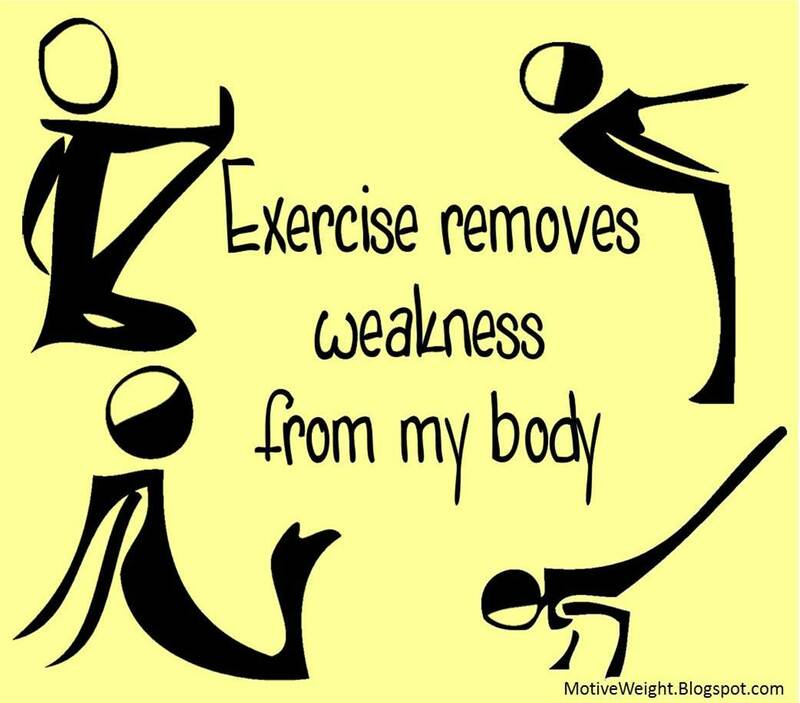 Exercise definitely removes weakness from the body. Once you start getting active, make it a point to sustain the regimen more than 6 weeks to see the results. It might also help to chronicle those changes through photographs. Upload these photos and look back to see how far you've come—and that it would be a waste to stop living healthily.